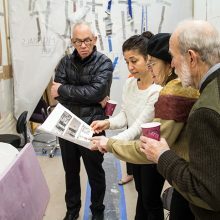 Three generations of Swindens visited EverGreene’s studio to view Albert Swinden’s 1942 mural, Abstraction, which he painted for Goldwater Hospital in New York City. 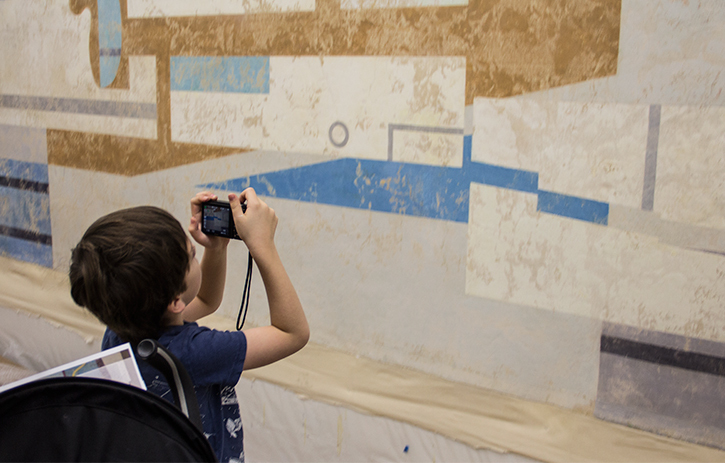 Swinden’s daughter, grandson and great grandson met with EverGreene project manager, Sarah Kloze, to take a peek at the work our conservators have been doing to conserve the large-scale mural. The mural, installed in one of the dayrooms of the historic Goldwater Hospital on Roosevelt Island, had been painted over and lost for decades. EverGreene conservators located this artwork, as well as the historic Joseph Rugolo mural, and safely removed the two works from the walls, careful to not damage the canvas. Using a variety of thin-blade palette knives and scalpels, they detached the canvas from the plaster substrate and implemented emergency paint-stabilization techniques as necessary. Swinden Family VisitOnce removed from the site, restoration began at EverGreene’s plaster studio, which had been converted into a negative-air chamber and lead-containment zone. 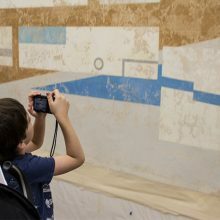 Conservators used both chemical strippers and hand tools to painstakingly remove the overpaint from the historic murals: scalpels and small blades proved most useful in the removal of certain areas of overpaint from the Swinden mural. Suprematist precision and simplicity is evident in Swinden’s mural; his use of abstract forms makes this work unique amongst WPA-commissioned murals. This was the first time his family had ever seen this historic work in person. 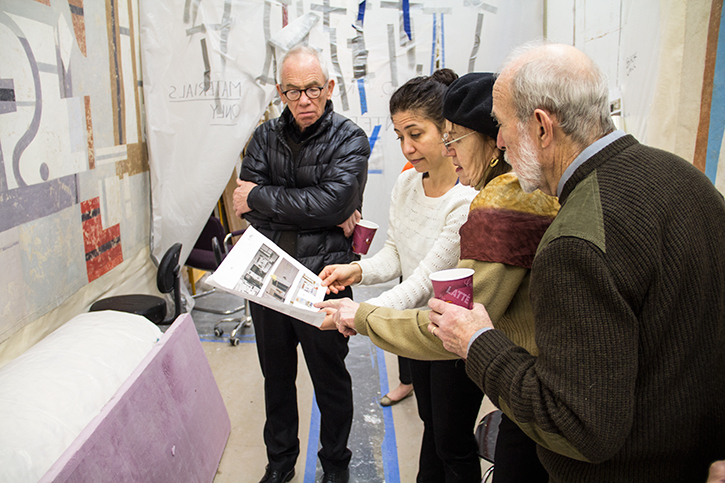 Last year, EverGreene hosted the descendants of artist Joseph Aurta at The Sherry-Netherland while our conservators restored the ceiling lobby mural. Restoring and conserving historic spaces and the art that adorned them not only preserves the architectural history of a region, but the legacy of a city, a community, a family.